Suitable for use in hot and cold water Suitable for front loader Grey water safe and biodegradable A high performing revolutionary powder that's quite different from standard green and eco products. 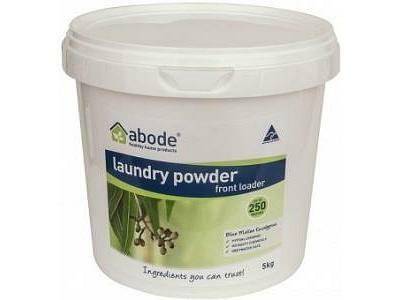 Forget the concoction of dangerous chemicals such as phosphates, petrochemicals, zeolites, and optical brighteners, this powder is highly efficient in cleaning clothes using plant based natural ingredients. The exceptionally concentrated formula means you only need a small amount (just a tablespoon!) which makes it economical as well as safe and effective! With organic eucalyptus essential oil, it effectively eliminates stains, abolishes dust mites and revives bedding and clothing. Front Loader Only. Ingredients: Soda ash (alkalinity builder), baking soda (food grade), sodium citrate (food grade), sodium carboxymethyl cellulose (derived from coconut oil), sodium coco sulphate (derived from coconut oil), sodium disilicate (derived from sand), alkylpolyglucosides (derived from corn, wheat and coconut) and pure Blue Mallee eucalyptus essential oil (Australian).